Lucky he was wearing a helmet. Not broken completely, but fractured. It worked. Nick (my son) came off a Scott Genius 20 mountain bike at the weekend. He was riding on an MTB trail and came to a jump. As he went upwards his shoes became detached from his SPDs. He lost his balance: the bike went one way, he went the other. He crashed down onto his right shoulder and his head hit the ground. He's okay. X-ray shows no breaks or other damage. Today, one of my other sons has gone off on his MTB not wearing a helmet! Nothing I can do of course. Posted by Patrick on March 28th, 2011. Patrick, I am so glad Nick is ok. Amazed your other lad didnt take much notice of the damage done to Nicks head gear. The helmet thing is so argued, but I for one would not be here alive if it were not for protective helmets. I had a riding accident when I was 15 years of age, a pony I was riding to the next village for a neighbour, was spooked by a tractor. Pony reared up, and I pulled him backwards with the reins and he landed on me on the road. My head was protected with a riding helmet. (again not everyone wore one at this time – 1970's). I was knocked out, and broke my arm in 2 places. Badly concussed, I went blind temporarily for about half an hour or so, and my mum was terrified as she drove me to hospital. Everything turned out well thankfully, due to the helmet I had been wearing, had I not worn one, my skull would of been badly fractured at best. My helmet was smashed in at teh back where my cranium smacked the tarmac. I still have the scarring in my retina. Every time I see a new opticians, they ask if I had a trauma as they peer into my eyes. I am very thankful my parents made me wear the horrible thing, and yes. I wear a helmet on my bicycles too. Hope Nick isn't feeling too sore and bruised today. Thanks Mary. Nick has his arm in a sling and a badly scratched back but all will be well. He was at the Gisburn Forest mountain biking centre – a few of them maybe showing off a little, how they do. Looking at the cracked helmet it's hard not to imagine what might have happened if his bare skull had hit the ground instead. At least they are sensible enough to know you don't do that stuff with no helmet. I've suggested to (son) Rob he should really wear one but he already knows that (he doesn't do the jumps). Lucky your mother had more influence over you than I have with them. They are older, mind you. When me and Sandra have been abroad we've not taken the lids as so few cyclists wear them, at least in Denmark and Holland. You might recall that Sandra fell there last year, and her head did hit the ground. Not sure what she'll do next time. It is in this type of road jumping type of thing that some form of head protection is of use. It is good he is ok. Spectacular. Glad Nick is okay. Expanded polystyrene is very brittle, so doesn't absorb much energy when it breaks. It earns its keep by crushing, which this one clearly has (certainly at the base), saving Nick from a headache or worse. Impressive photo. I'm glad it is the helmet on display and not the skull. Yes, very glad to hear its only his helmet thats damaged. It earns its keep by crushing. You'd think so, wouldn't you? You would imagine the helmet material would have some 'give' to soften the blow. This one simply seems to have cracked. None of the expanded polystyrene seems to have deformed or compressed – it just broke. It is basically just a rigid shell. I know they are tested. It seems surprising how brittle they are. What does anyone think of this? 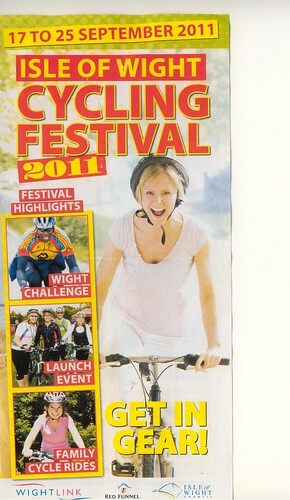 Its the main flier for the IOW Cycling Festival for which helmets are compulsory. Strikes me as a textbook example of how not to wear one! I read recently that a cycle helmet constructed from corrugated cardboard had won some sort of award. Lighter than the one in your photograph, and presumably with more 'give'. Dunno. Glad to hear that Nick is okay. Why are helmets compulsory during this event on the IoW, Hilary? Is it perhaps sponsored by some motoring organisation determined to place obstacles in the way of the casual cyclist? Oh, must be around ten years ago, I was riding like the wind down a bridleway in Nottinghamshire. I felt a small but noticeable impact on my helmet. I stopped and found a hawthorn thorn, of around three inches in length, had firmly embedded itself in my helmet. To this day I remain thankful that I had the sense to wear a helmet and that I didn't inflict serious trauma upon my limited number of brain cells. These days its just the 'riding like the wind' I have trouble with! I like my helmet loose but not that loose! It's for comfort but also – a theory – if I hit my head, the helmet will slide over my skull, reducing the jolt. I realise it might come off for impact number 2 but that's what I do. I suspect they are compulsory at the IoW Festival for insurance purposes. The hawthorn incident sounds nasty. I've had them stuck in my tyres but not my helmet. I think they should be made of a less rigid material, a bit softer on the inside with a rigid outer shell, more like lacrosse helmets but without the cage. I used to hate the concept of wearing a helmet, partly because (and I don't profess to know the reason why) they all seem to look so naff! My daughter (non-cyclist) reckons they look like a bunch of psychedelic rotting bananas. When I starting cycling around the lanes in Cornwall though, I discovered a helmet is essential. No it won't help if I run head on into a 30mph lorry! 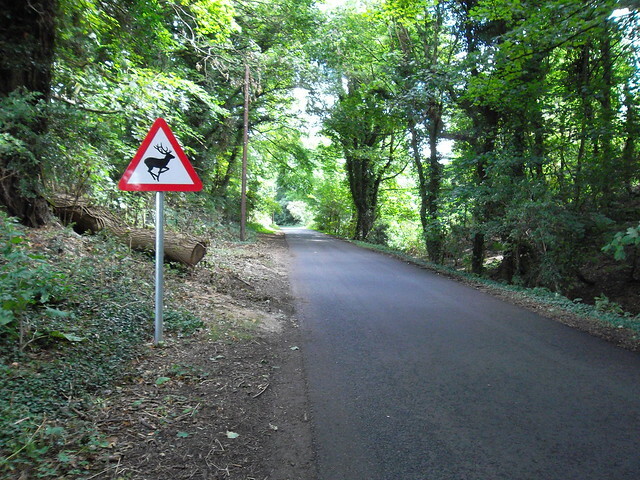 No it won't help if I come off at 40 mph at the bottom of a mile-long hill. But boy is it useful at 15 mph when I find the one protruding branch that the council hedge-cutters have left sticking out of a hawthorn hedge. Almost every time I ride I hear and feel the 'tap' as a half-inch branch bounces off my head. Thank god for bananas! Most sponsored events nowadays make helmets compulsory. My guess its purely to stop them being sued if someone is injured. By insisting on helmets, I guess they can claim, under Health and Safety legislation, to have done everything possible to protect the participants. By insisting on helmets, I guess they can claim, under Health and Safety legislation, to have done everything possible to protect the participants. Yes I expect thats the reason. Shame they don't encourage people to wear them properly! Oh no! Not another Helmet thread??? Glad he's ok of course. I'm a hypocrite. I don't like them and won't wear one – but I do wear one because I'd get hassle if I didn't. The opponents say that they make you careless. There's evidence for this. It's called risk compensation. But, I nearly always wear one. I don't if it's 35C or more but wear a good sunhat. I'm extra-careful then. I wrecked a helmet almost identically 2 years ago. I was concussed. I wasn't sure whether to add this story to this post. A number of nationals have carried the story and there have been some insensitive comments made on the online versions of their newspapers. 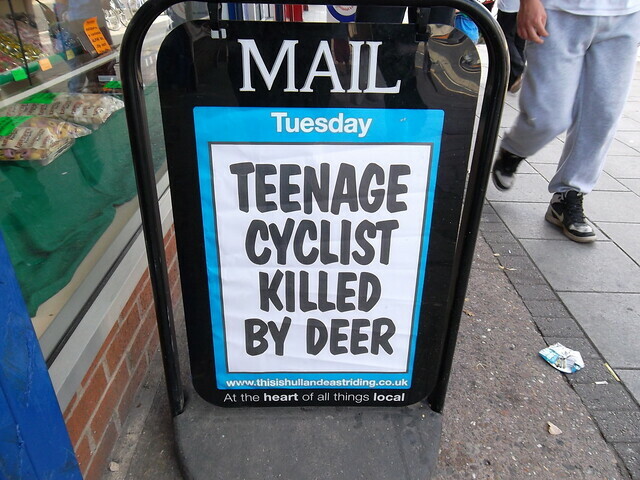 A teenage boy, Ben Madden was seriously injured after his bicycle apparently collided with a deer in Elloughton Dale, East Yorkshire. Later reports confirmed that Ben wasn't wearing a helmet. The boy was cycling down Elloughton Dale Road – not far from the top if the roadside tributes are anything to go by – when the accident happened. Ben, 15, died after being in a coma for several days. As always, opinions are strongly divided on whether or not Ben should have been wearing a helmet. Annette Brooke MP (Lib Dem) wants mandatory helmets for children under 14 cycling on roads and in open spaces. Norman Baker MP (Lib Dem 'minister for cycling') says it's his libertarian right to choose not to wear one and decide for himself what is best for his children. Annette seems unlikely to have her way in the current political climate. I remembered this old topic and because of the way I feel safe writing on here I would like to share this. My wife was hit by a car from her left whilst on a mini roundabout just over three weeks ago. She was kept in for two weeks then discharged to home with a body brace. At 4 am yesterday morning she phoned me as she was in pain with the fractured T5 vertebra and was taken back to the QE hospital and is now waiting for spinal surgery. She was wearing a helmet and this did save her from further head injuries. The helmet is damaged with clear signs of impacting the road on the rear and right side. She as Hillary does not have the straps that tight so that the helmet can move, which it did and was told this avoided a neck injury (how bad she was not told). The helmet did crack but did absorb the impact force by distorting before it did so. It was just stressed to much, however it did not pass on any noticeable impact to the wearer. She was not able to put her hands down to protect her head as in this sort of incident you do not have time to do anything other than bounce if you are lucky. This was clearly one of those times when a helmet did do a lot of good, according to one of the Neurosurgeons who is going to operate on her. I definitely agree with him and am so glad she always wears her helmet as I do. Keith, this is terrible news. We wish your wife (and you) a speedy and complete recovery. Keep us posted. Yes, please give her our best wishes and keep us posted. Hoping the op goes well. Thank goodness for the helmet. I have been visiting some dark places in my memory best left closed overnight, about helmet design and the whole body. I have realised that nearly all helmet tests are done wrongly. The involve dropping a weight down from above to the top of it. But this is not how they work. The side is the part that normally makes contact and it is the deformation of this section that is critical especially in the area above and forward of the ears. The side of the head being reasonably flat is also not good at resisting force applied to it and the skull is not designed for this sort of impact. 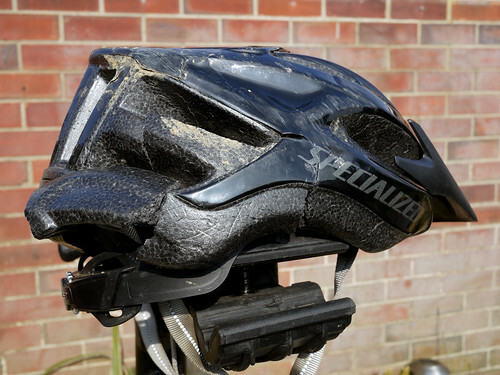 When a helmet is subjected to loads from the side it dissipates this by deforming and transferring not absorbing the loads. That is why the crack across the top, this is often misunderstood as a weakness when it is an incredibly important part of the design. The cracks across the top are like those in toilet paper ripped along the perforations. They are easier to start and with the stop start action absorb more of the forces as this has to build up in each bit before release. If it were solid the original force needed to cause the crack would but immense on a flat surface and the energy released into the head upon collapse wold be very high and more importantly sudden. To put it succinctly a cycling helmet is designed for a side impact and cracks to slowly release to stored energy instead to transferring this energy to the head. So sorry to hear this Keith. Please give your wife our best wishes and make sure to look after yourself too. Thanks for the nice thoughts Hilary. I have a thread on the CTC forum about my trials and tribulations of everyday life. You might enjoy the read. This happened to me not too long ago. I would never, ever go out without a helmet on.